What is the Metabolic Ideal? The most obvious reason that horse nutrition is important is because horses are animals with a metabolism which requires food to produce energy, allowing the cells of the body to reproduce and repair themselves. As a horse owner you don't really need a degree in cell metabolism to be capable of feeding a horse, but it is helpful to understand the basic metabolic processes. In this way you can make a more educated analysis of the whole picture of your horses health, and judge what may be missing from the diet, or what may be causing a problem. 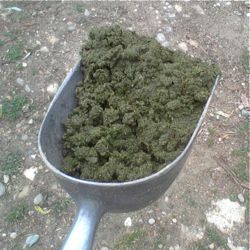 Of course you can just buy a complete feed, and give the recommended amount, but this is not always the best alternative for reasons which are described later on in this page. Basically horses need to take from their food protein, carbohydrate, fat, minerals and vitamins. Some horses have a more efficient (healthier) digestive system than others, these horses will gain more from what you give them. They seem to 'live off thin air' as the saying goes. 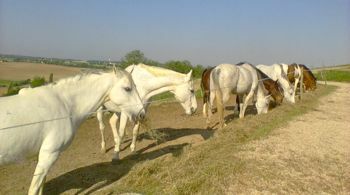 Other horses will not be able to assimilate the food so well - the 'poor doers'. 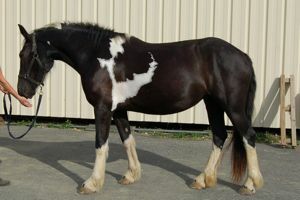 There are no doubt genetic predispositions in play, for example native ponies tend to do better than thoroughbreds, but the most influential factor as to the efficiency of a horse's metabolism, in our opinion, is simply how healthy he is. Unfortunately many modern practices purporting to ensure health often seriously inhibit it. This is discussed below. Proteins are long strings of amino acids, each type of protein has different ratios and orders of amino acids, and they bunch up together to make a particular shape for use within the body. Their uses range from building materials to hormones, which are like messengers which stimulate different organs. They are fantastically important in the body. For a particular protein to work properly, all the necessary amino acids to make it must be available. Roughly half of these amino acids can be made in the body, but the rest (essential amino acids) must be taken from food. Often a protein will also need a vitamin or a mineral to form itself properly as well. Carbohydrates and fats are different forms of what can be thought of simply as energy providers. Fat is energy in a form more suitable for long term storage, whereas carbohydrate is more easily available. In molecular terms fats are made up of fatty acids and glycerols, whereas carbohydrates are various types of sugar molecule. The metabolic processes for fats and carbohydrates are different. Energy is essentially the fuel for life. Horses, like us, need energy to power their muscles so they can move and breathe, so their hearts can beat, and their brain cells can function. They need energy to power all the metabolic processes and the removal of wastes and toxins from their bodies, and this is only a fraction of the whole picture. 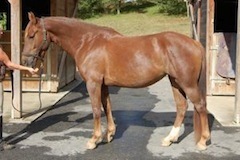 It is easy enough to judge a horse's basic condition in terms of his fat coverage and muscle development. You can make a judgment about his digestive system from the quality of his droppings, but it isn't always obvious from the outside how healthy he is inside. In our experience, a horse can exhibit a kind of superficial healthiness: they will look well and shiny, but there is almost a kind of shell-like look to them, like a sweet with a hard shiny exterior. This is the look of horses who have been eating a very sugar-rich diet. Invariably such a horse will not have a tough digestive system and vigorous organs. A horse in this state of health will have to go through the same rehabilitation process as a very poor, dull coated-looking horse, and in the process may lose condition before his own life-force comes back into play. The important point here is: horses know how to be healthy. They are naturally tough, healthy and vibrant in their undomesticated environment, if allowed to heal themselves. Yes, we absolutely must make the necessary compensations for the changes to their environments that we can't help imposing on them - like the fact that we ride them, and we restrict to some extent the space they have to move about in - but it is not our role to interfere with their healing systems. The best we can do is provide as much support as possible, and be open minded about that. This 2yo filly has never had a vaccination, a synthetic wormer, an antibiotic, or any other drug in her life, and she is easily one of the healthiest horses we have ever had. Prevention is better than cure, and horses who have never been exposed to the damaging effects of pharmaceutical products will maintain a profound health in their whole organism throughout their lives (although much less likely, this does not mean that such horses will never be ill - this is normal in order to develop a robust immune system - it means that their healing resources will be at an optimal performance level). Rehabilitation is possible in the majority of cases but there will be a recovery period of several years when symptoms are no longer suppressed, and the intrinsic organ damage will manifest itself before it can heal. To be frank, it is time for everyone to wake up to the propaganda that is all around us. Remember that the single and sole intention of pharmaceutical companies and insurance companies is to make money, they are not interested in the health of your horse. In dietary terms, the metabolic ideal will therefore be most successfully achieved by reproducing the wild horse's diet as closely as possible, and interfering as little as possible with artificial 'preventatives' or symptom-curing drugs. In these photos, the horse on the left shows the unhealthy 'condition' brought about by the use of steroids, and a high-sugar diet. The feet are conveniently hidden in this publicity photo, but you can guarantee that they will not be in good shape. This may be an extreme example, but many domestic horses show this artificial 'good health' in a more subtle way. The horse on the right, however, is an example of genuine good health that seems to glow from the inside. She does has a low-sugar diet, has very healthy feet, and receives no synthetic drugs of any sort, including wormers. Happily if you can get the basic horse nutrition right, you will find many positive outcomes happening as a result. One of these is that a low-sugar high-roughage diet gives horses what is often called slow-burn energy rather than an energy burst followed by a low. Simple sugars like sucrose which are present in higher quantities in grass than in hay because they are water-soluble. If the grass makes more energy than it uses to grow, it will store it as fructan in its leaves, and starch in its seeds. The amount of these forms of stored energy depends on whether the grass is photosynthesizing (depending on light availability), whether it is growing (depending on temperature) and whether it has been able to go to seed or not. The actual structure of grass is cellulose, often called fibre, which horses are able to break down into usable sugar. Unlike us, they can do this because their gut contains bacteria which are capable of breaking down the cellulose molecules and releasing the energy. This is one reason why it is very important for horses to have a healthy digestive system, so that these bacteria are not damaged. Remember that grass stores its excess sugar in the form of starch in its seeds. Think of the difference in size between grass seeds and the seeds of cereal plants such as barley or maize. Each type of grain differs in terms of its digestibility and levels of starch. Oats are the safest type of the commonly-fed cereals because they are most easily digested, and have the lowest levels of starch. The damage occurs when the carbohydrate is not digested completely in the foregut of the horse. This is why digestibility is so important. If too much undigested starch finds its way through to the hind-gut there will be a population explosion of sugar-eating bacteria. As well as creating undesirable toxins which find their way to the sensitive laminae in the feet, a generally acidic environment will result, which can kill off the important cellulose-digesting bacteria, and ulcerate the intestinal wall. Incidentally this will also predispose the horse to parasitic invasion. 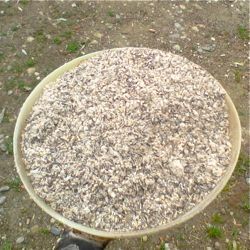 Many modern horse feeds will cook grains in various ways so that they have high digestibility and are therefore 'safer' for the horses to eat. It is still a question of quantity however, and it is never going to be possible to feed any significant quantity of cereal safely, and certainly not the amounts many people do feed in reality. In any case, the safe quantity is always going to be difficult to gauge. This is the kind of lush green grass that, although traditionally thought of as the ideal for horses, is actually extremely harmful due to it's excessive sugar-content: only eight kilos of this kind of grass contains as much sugar as in one kilo of molasses! This, on the other hand, is the kind of grazing that horses have evolved to eat - dry, low-sugar, high fiber content, varied grasses and shrubs to browse on. Metabolic systems are highly complex chemical reactions, beautifully synchronized, which have evolved over an incredibly long time to generate life on a grander and grander scale... we were amoebas originally remember, and now it is possible for a blue whale to exist. We have to think about the significance of that, and not imagine that in the last ridiculously tiny moment of time on our planet we have developed the understanding to improve these systems. The drugs we are so proud of act in a laughably simplistic and one-dimensional way in comparison, if we understand how they work at all. These reflections come not only from observation of different types of animals in different states of health and disease, but more significantly for us, from the ability to feel through the central nervous system, and actually feel in the body the effects of vaccinations, antibiotics, wormers etc. Incidentally this ability is attainable by anyone with a central nervous system! When you can actually feel, for example, the way antibiotics suppress the immune system, suffocating and overwhelming the inherent life-force, you realize how little we really know about such things. Our healing systems are intrinsic. We should be studying the best ways to access and stimulate them in ourselves and our animals, or more correctly, studying what is blocking them whenever they seem to be weak or dysfunctional. We have become frightened of healing processes because we are essentially frightened of the symptoms of disease. When we were developing the understanding of horse nutrition that we have now, we decided we wanted to find a supplement which would act as a kind of buffer in cases where horses for some reason were missing some essential metabolite. We have heard that if a horse loses condition beyond a certain point, certain metabolic processes will shut down forever, and this is why it can be very difficult to rehabilitate malnourished horses. Why shouldn't it be the case for all poor-doers that they need some mineral or vitamin in particular to get them back on track? Horses recovering from illnesses, and horses undergoing healing processes may also need such a boost. We did a lot of research to find this supplement because above all we didn't want to be giving our horses something which would hijack the processes already working efficiently. Often this is what happens when people give their horses something like, for example, a glucosamine or chondroitin supplement for joints. The horse's own body will then produce even less of its own joint lubricant because there is so much of the infiltrator around in the bloodstream. Often the source of joint problems is spinal or related to shoeing so trying to influence the joint itself will only work in the short term. The other important consideration is that natural supplements have the great advantage of being synergistic, with the natural intelligence inherent in all living molecules intact. Synthetic molecules are simplistic and devoid of this intelligence. For this reason they do not harmonize with the body's own complex and intelligent biochemical organization. To complete our horse nutrition, we were looking for something which would replenish any deficiencies, providing almost a homeopathic amount of a wide range of substances which would act as a little wake-up call to the body. After all healing is simply about recognition. In the end we found bee pollen. It contains a phenomenal range of substances in small quantities, as well as being something wild horses will consume when eating flowers in the springtime. The 26yo mare who had been through some very low periods when she lost some of her teeth, picked up almost ridiculously well. She put on weight, her back came up, and her head looked young again. She even started to be able to gallop around around. She is now 29, and she is almost too fat this year. 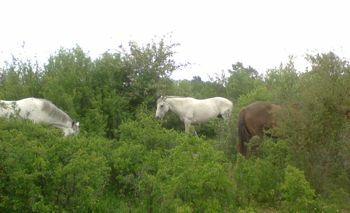 After a certain period of time, the horses started to ignore their mineral licks. Over time, there have been many subtle but profound improvements in health. As we are working all the time with different horse's healing processes and sometimes feeding herbs and other natural health promoters, we can't say in any case what is as a result of this or that exclusively. 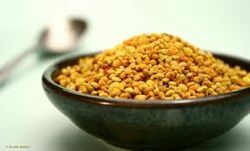 One thing we do know is that the bee pollen is exactly the supplement we were looking for. It provides that little extra metabolic help when it is needed. We don't feed bee pollen absolutely all the time. This avoids any possible dependency which might develop. This is our old arab mare, in the left photo aged 26, before we started feeding bee pollen - although she has her summer coat, she is looking very slim here for the time of year. In the right-hand photo she is 29, and looking considerably better having just come through the winter. Horses feet have a highly specialized structure with a mechanism evolved to satisfy the high demands of the wild horse's life. Wild horse's feet have to be tough enough to carry their weight (around half a ton or more) over all kinds of terrain, often rocky and steep. The hoof must be able to grow to replace worn down horn, while at the same time they must retain a very particular shape which allows the whole leg - consisting of several joints, complex ligament structures and tendon arrangements - to stay in balance. This balance is not just important to maintain a healthy musculoskeletal system, it also plays an important role in facilitating the blood pumping back to the heart. Their feet must also be sensitive enough for them to feel their way carefully and sense vibrations in the ground. The typical grass diet causes sensitivity in the feet because, in most cases, the type of grass available to our domestic horses is too rich in sugar. Horses cannot metabolize sugar without generating molecular byproducts which damage the highly sensitive laminar tissue. 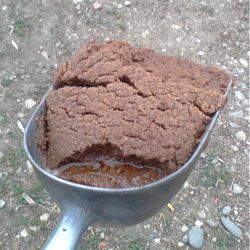 Typical cereal and molasses-coated horse feeds contain high levels of sugar. 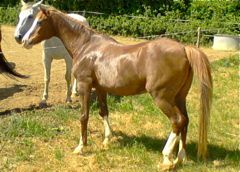 Typical domestic horses don't move enough from birth to stimulate the correct development of the structures in their feet, particularly the frog and the digital cushion, which are much thicker and more flexible in a wild horse's foot. This means that domestic horses tend to have more sensitive feet than wild horses regardless of their diet. We ride our horses, so we are dictating where they go when it might be sore for them. 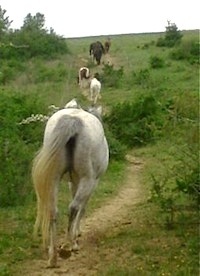 We also often want to ride on tarmac or hard surfaces which wear hooves down more than natural terrain. In fact there are solutions to be found for these difficulties, and they will not harm your horse in the ways that metal shoes do. More information on how and why shoes damage your horse's feet, and successful alternatives can be found on the Natural Hoof Care page. Here are some of our horses moving round their 'Paddock Paradise' lane system. This is one the ways we can simulate the wild horse's environment by limiting consumption of rich grass, and encouraging movement and social interaction. Horses are different from us in that they must have food passing through their gut all the time. This means they have to eat between 12 and 16 hours out of every 24. Often people will attempt to adapt this physical requirement to what is practical for them by feeding large amounts of high-energy food much less often. 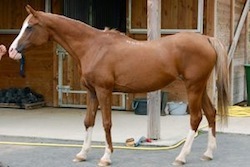 For example the typical diet of a racehorse is gravely insufficient in terms of quantity of fibre. Of course this has physical consequences, but we must think of the psychological ones too. Even people often want to continually nibble at something or drink another cup of tea, so horses must be feeling the need to eat virtually continuously. Unless they are resting or working, they are going to be wanting to eat. This is why we have to give them a diet in alignment with their physiology i.e. a diet that is low in nutritional value, yet constantly available. Otherwise they are likely to develop anxiety-related behaviors, such as cribbing, wind-sucking, box walking, weaving and biting. There are other reasons of course that these kind of vices are taken up, but this is probably the most common one. It is particularly dangerous to leave a horse in a stable with inedible bedding and insufficient hay. They are relying on us, and even if they are in good condition, they don't know when they will next have food. It isn't fair to put them under that kind of stress. When we lived in Scotland we had big fields which grew enough grass for our horses and the farmer's sheep during the summer. Often we didn't even need to provide hard feed. In the winter we gave them haylage because making good hay is not an easy thing to do in Scotland and we did realize the importance of quality forage. As time went by and we accumulated more horses, our farrier developed a bad back (not as a direct result of our horses!) but nevertheless he just wasn't prepared to have to take time with the youngsters and when we simply couldn't find another farrier we were left with one option - going barefoot. In fact he did us the biggest favour imaginable. We were forced to rethink the mindless tradition we had been investing in for so long, although it has been a long road of discovery since then. The very high sugar diet the horses were getting, despite all the expensive probiotic feeds and herbs we gave them, were causing the horses feet to grow fast, and continuous laminitic events we weren't even aware of resulted in the balance of the feet being lost, which wasn't helped by our ignorance on the trimming front. The horses looked well though, so who was worrying? When we moved here to the South of France, however, we had to evolve substantially in our understanding of horse nutrition. We don't have the continuous supply of grass here, in fact it is almost like there are two winters in terms of grass-growth. During the usual winter, although it is much shorter than in Scotland, when it is wet here the clay soil is easily damaged and the grass suffers. Then it grows crazily in the spring, and following that is the 'second winter' when we have the fierce summer sun which burns off the grass (unless we have a wet summer, but that is rare). We couldn't find haylage here, and in rediscovering good quality hay we realized with hindsight that the haylage hadn't been beneficial for our horses. It is too rich for their gut on the whole, and they would really stuff it because it was so tasty too! So we got used to the idea that they had to have hay all year round, and as it turns out this is excellent for their feet and their gut as well. They get used to it and they actually prefer it to grass most of the time, so they eat the hay as their main diet and then go and have a pick at the grass on the lanes which encourages them to move around. It has a stable nutritional content, so there are no big shocks for their feet, and we can control the springtime grass danger with our system of lanes so that their feet stay happy. In the summer they don't attract flies in the same way as horses eating more grass. We think that there must be a sugar metabolite that they produce when have a mainly grass diet which comes out into their coats, making them a fly target. The dry nature of hay is much healthier for their gut, it keeps the peristalsis going and makes it a difficult environment for parasites to live in. The low sugar content is less attractive for parasites as well as encouraging a healthy gut environment. 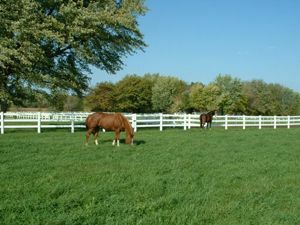 When grass is overgrazed, as it often is for domestic horses, it produces stress toxins which damage the laminae of the horse's feet when ingested. Hay, of course, does not contain these toxins. 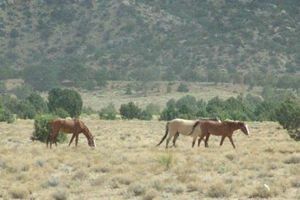 Because of the relatively vast areas that wild horses roam, overgrazing of their pasture would be an unusual occurrence. At this time we were still feeding a high cereal hard feed diet, however, and in the course of coming to understand the importance of the whole low sugar issue, we decided to cut down the cereal content. However despite the certainty of many natural horse care advisers that it is possible to feed working horses like this, our horses were losing weight. It may have been because people who go for a more 'natural' outlook in the management of their horses don't do much actual training with them, or maybe because these ideas were new, they hadn't been tried out sufficiently yet, but our horses really weren't getting enough, so we had to think again. It took the horses a month or two to adapt to the new energy component of their feeds, but they quickly picked up their condition and now they are all healthier than they have ever been and are looking great without exception. The fatty types are more athletic and the skinny types are looking round. Soaked alfalfa nuts, which are an excellent source of protein, vitamins and minerals. Alfalfa is also an important component when horses are eating a mainly hay as opposed to grass diet, because hay doesn't contain enough omega-3 fatty acids. Omega-3 fatty acids control many basic functions of cells, such as circulation and fluidity of the cell membrane which affects the intake of nutrients. We give them a small amount of organic tiger oats which we crush fresh every day. In fact oats are a calming herb and they are very good for horses, although you have to make sure you balance the calcium deficit (alfalfa is excellent for that). They are only 'heating' if you overfeed them, and this depends on the individual horse. In fact any herb which is over fed will produce the opposite effect of its beneficial one. Horses love oats too and a little bit of what you fancy does you good!